You are currently browsing the tag archive for the ‘Safety Not Guaranteed’ tag. Saw this one in theaters with my family. In completely unrelated news, I haven’t been asked to pick a family movie since then. The film is gratingly lo-fi. Which means the actors don’t have anywhere to hide. Aubrey Plaza actually acquits herself quite nicely, she can definitely anchor a movie. And Jake Johnson can curmudgeon his way across any screen of mine any time he likes. Mark Duplass, though, I don’t know. At this point I’ve seen him in a bunch of things, and I’m impressed with the variety of roles he takes, and that he also writes, directs, and produces many films. But I can only take him in small doses of smarminess. The Mindy Project has used him well, I think. And he’s best on The League when relegated to a supporting slot being douchey. I will say that this movie has a cameo it managed to hide very well. Also, the guys who wrote and directed this (Derek Connolly and Colin Trevorrow, respectively) are lined up to do Jurassic Park IV. So, uh, be prepared for that. This one came across my radar because I saw multiple places talking about how it was a riveting, surprising thriller which defied genre and contained some crazy twists. I…must have seen a different cut of the movie than everyone else? I was never on the edge of my seat, save for that one time I almost nodded off. Weird for the sake of being weird, I suppose the film did kinda cut through genres, but not to any meaningful effect. For me, the film just became progressively more and more bonkers. A little unsettling, sure, but more puzzling than disquieting. And I didn’t find the film particularly twisty. There’s one bit at the end, but by that point the movie had veered so far off course that the twist didn’t have the impact it must have had on others. I’ll always remember seeing this in theaters with John. Not due to anything from the film, which may well have been the least essential movie of the year. Helen Mirren was fun, naturally, but man, what a waste of her and everything else. There was no reason this story had to be told, because there wasn’t really a story at all. But anyway. So I meet up with John before the movie. We watch the movie. We walk the six or seven blocks to California Tortilla. We order food. We eat the food there. We chitchat, of course. I remember at one point John mentioned how he had realized NBC still had the prior Olympics up online so he was watching something like archery. So. Including the movie, we’ve been hanging out for about four hours at this point. We’ve finished up the tortillas and it is just about time to start heading back home. And then John tells me, oh, by the way, he proposed last weekend. The movie that launched a million jokes on the Internet. It made two big mistakes, I think. First, I haven’t read Seth Grahame-Smith’s novel, but his screenplay is entirely too earnest. There are plenty of vampire movies these days, most of which have, frankly, more engaging dramatic premises than our 16th president deciding to fight the bloodsuckers. If any movie was set up to be tongue in cheek, it was this one, which took itself entirely too seriously. Second, the story’s structure is rather awkward. 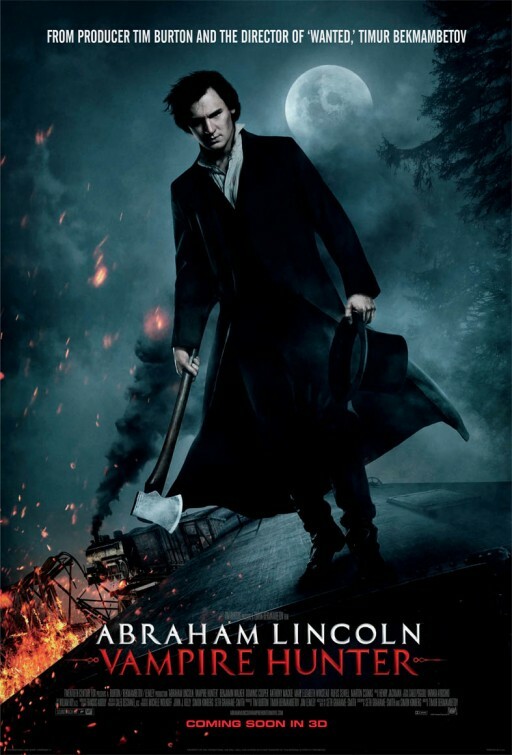 It felt like the first three-quarters of the movie was an origin story, and then as soon as Lincoln gets involved with politics, we jumped forward to the presidency, with a climactic action sequence. A sequence which was, admittedly, pretty cool, surely thanks to director Timur Bekmambetov who would undoubtedly be my first choice to direct any sort of gothic and/or steampunk scenes my movie required, though I might ask him to step aside once filming of those had completed. 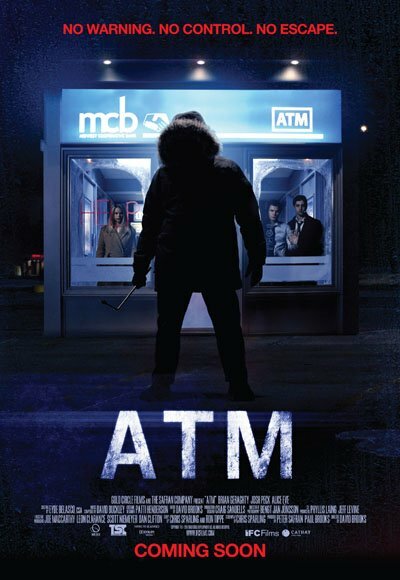 A highly interesting cast, including Dominic Cooper, Benjamin Mackie, Rufus Sewell, and Mary Elizabeth Winstead was pretty much wasted, with Jimmi Simpson the only one who I thought managed to come off OK. Multiple movie blogs I follow were in love with this film. There’s, sadly, only so much time to watch movies (even for me! ), and so I have to make hard decisions about which movies to see. And an important factor is whether the movie inspires passion in anyone. Better if it someone whose opinion I respect, of course, but I’m always fascinated to see which movie inspire fervent emotion. All of which is to say that while I personally found this movie kinda boring, I stand by the process by which it ended up on my Netflix queue. The structure of the film was kinda cool, with Denis Levant taking on a number of different personas in a number of different situations, over the course of a day. And Levant was quite good in the role (even if Tatiana Maslany has essentially ruined actors playing different characters). I could see the different parts of the day working well as a series of one-act plays tied together by some common purpose or theme. But to me, the different parts of the days felt like disparate middle acts of a wide variety of three act plays: experimental, musical, etc. without any reason they were mashed together. Rachel Weisz received some Oscar attention for her performance in this film, including garnering a Golden Globe nomination. Unfortunately, there were three major roadblocks, none of which were her fault: the film was released early in the year, nobody saw it, and it is mind-numbingly dull. It is a character study without really studying a character. People mope, stuff happens off-screen, people get angry or sad or mope some more. That’s not entirely fair, of course, I get that it is about love or wanting to be in love, and a time not so long ago when women still didn’t have a ton of options (or, at least, were constrained by society) in terms of deciding who or how to love. Although, really, I could say it is about pretty much anything. Not like you’ll stay awake long enough to disagree with me. Tom Hiddleston is solid, as usual. Rachel Weisz is good, certainly better than Quvenzhane Wallis, but I’m not sure she would have made my final list. I’m sad I didn’t like this one, because John August wrote the screenplay, and I’ve loved his blog for years. But this half-baked riff on the story of Frankenstein’s monster was entirely forgettable. The concept of all these horror movie standbys being in middle school was pretty clever, but that seemed to be about where the creativity stopped. Imdb lists a biopic of Margaret Keane as Tim Burton’s next directorial effort and one wonders if the break from his gothic sensibilities might do him some good. An action movie for people who don’t like action movies. (And I love me some action movies.) The film is super stripped down, which in theory is a welcome breath of fresh air compared to summer blockbuster fare. But Soderbergh and screenwriter Lem Dobbs go too far in the other direction, as this film is spare to the point of distraction. For me, the comparison to make is with Colombiana. Both feature strong and deadly hitwomen, but where Colombiana is fun and gripping, this one was a chore to get through. Soderbergh did a great job pulling down name talent, as Channing Tatum, Michael Fassbender, Ewen McGregor, Michael Douglas, and Antonio Banderas all litter the cast, among others, but almost serve more as a distraction, given the limited nature of their roles. Speaking of Colombiana, I would love to see Gina Carano in a Luc Besson film, I think that’s pretty much a perfect match. I want to stress that I think Alice Eve is a talented actress. She’s been in a couple of my favorite movies, but even in the clunkers she’s shown an impressive magnetism. I sincerely hope that she gets a chance to play some meatier roles in the near future. That said, since I’m going to lose my man card with the next movie on my list, let me ask a question. If you are going to have a movie where Alice Eve is trapped in a room and decided that harsh weather would play a factor, would you decide to place the setting somewhere cold, where she’d have to wear as many layers as possible, or, I don’t know, somewhere really hot where it is the exact opposite?! I feel like that should have been the studio’s first note. 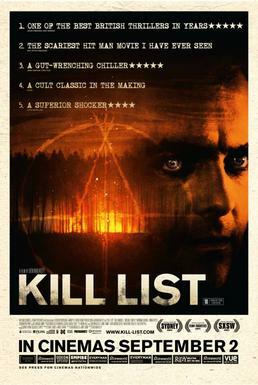 At any rate, I tend to be a big fan of one-setting films, but this one missed for me. It wasn’t terribly clever, and the ending was far from satisfying. The end credits seemed fascinated by the bad guy’s detailed and elaborate plans, but said plans weren’t really displayed in the movie. I’m scared to look back and see how many years in a row I’ve told myself to stop watching terrible Marla Sokoloff films. I’d like to say it ends now, but let’s face it, time has shown that I’m an idiot. 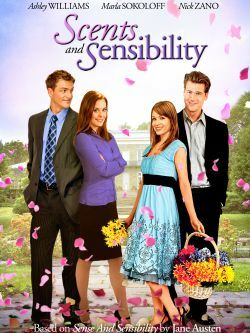 This one is based off of Sense and Sensibility, only Marla Sokoloff’s character has a real talent for making scented lotions, so it is Scents and Sensibility. And that’s probably the most clever thing about the screenplay. The film also stars Ashley Williams (aka Victoria from HIMYM). Who, like Sokoloff, deserves better. Most frustrating to me, I think, is that I know many people poured many hours into making this film. I’m sure most, if not all of those people put in hard, solid work, work of which they wanted to be proud. So I can’t understand the process which led to this film being the final product. Surely at some point, someone asked about the vision, the creativity, the flair, the reason for existing so sorely lacking from this movie?